Here are additional sites with information and support for BASIC Stamps. Parallax is the manufacturer of the BASIC Stamp. Their site includes all the manuals for free download as well as many application notes, schematics and FAQs. Many of the documents can be found in the downloads web page. The application notes for the original BASIC Stamp I are still very useful for ideas, so don't pass them up. They still have relevance for the BASIC Stamp II. There is also a good STAMP_FAQs document. Parallax maintains an very active email listserver. Visit <http://forums.parallax.com> to join and to participate in the mailing list, or simply to browse through the archives. You can execute a search through the archive there in hopes of answering your burning questions. The Google search facility at http://search.parallax.com us better than the one on the search bar. There is also an archive there of the messages from the earlier Yahoo groups list. Scott wrote many articles for publication in Nuts and Volts magazine, on how to use the BASIC Stamp. I understand that Scott also wrote the original series of great application notes that appear in the BASIC Stamp I and BASIC Stamp II manuals. He has built a business around his serial LCD screens and other products that take away some of the strain of building projects with a BASIC Stamp. His DCPB (Data Collection Proto Board, now discontinued) was my own introduction to the capabilities of the BASIC Stamp. The manual is available online at Scotts's web site, along with lots of other application notes. Al puts up a Stamp Project of the Month, which includes material from his many published articles and books. This includes material on interface to PCs via the serial port using QBASIC, Visual BASIC and other PC higher level languages. He has a math coprocessor and a pwm module for sale, and probably other stuff too, as his offerings grow by leaps and bounds. These modules are called "PAKs". In addition, he maintains a popular database of Frequently Asked Questions. Stamp FAQ. Peter has published extensive tutorials on the BASIC Stamp, based on teaching experience with his students. He must have a great program there at Morgan State U. in Maryland. He has lots of material on his web site (including material on weather monitoring projects and sensors). He also has educational kits, parts and stamp accessories available for sale at low educational prices. Many of these accessories were developed by his advanced students. L.O.S.A - List of Stamp Applications Christer has maintained and extended this list for years. It shows a wide variety of things people are doing with BASIC Stamps. Many of the descriptions include further contact information or a web address. 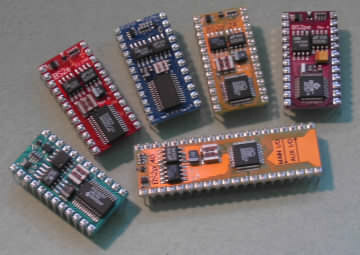 High Tech Horizons" offers a number of products for small microcontrollers. Especially notable is the PLM-24 power line modem, much more capable than the common X10 devices, and the SNAP protocol engine for networking multiple Stamps and microcontrollers. Home of Stamp Plot Lite (free) and Stamp Plot Pro (inexpensive), PC programs for capturing and visualizing data output from the BASIC Stamp. Uses simple Debug commands to direct and format the output. Also available is the BISCIT system, a means of controlling a stamp system with Active-X controls over the internet. Martin Hebel and Will Davenport at SIU wrote the Industrial Control text for the Stamps-in-Class program, and both authors are active on the Stamps mailing lists. Solutions Cubed manufactures several modules that offload certain tasks such as timekeeping and running motors from the main stamp processor. Lon Glazer of Solutions Cubed has written a number of Stamp Applications columns for Nuts and Volts magazine. "Manufacturer of the famous BOB-II Serial Video Text Display Module! " This is the magazine that carries the most information about the BASIC Stamp, including the Stamps applications articles by Scott Edwards, Jon Williams and Lon Glazer in their archives. Jan wrote the book Serial Port Complete, replete with information serial data transfer in RS232 and RS485. Her site includes links to articles she has written for Microcomputer Journal and for other publications on microcontrollers and interfacing. Don has been writing about electronics for as long as many of us can remember. He is a BASIC Stamp enthusiast. His pages are full of all sorts of strange and wonderful information and links. based in the United Kingdom, Warburton specialise in the distribution of Parallax Basic Stamps and other microcontroller based products and development tools.